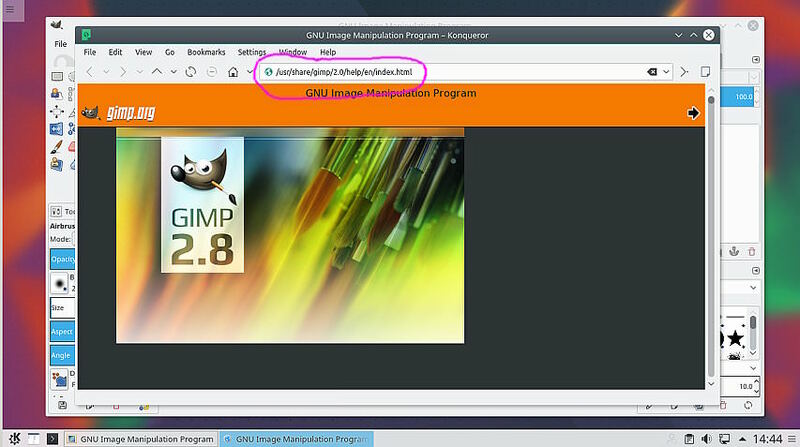 How does gimp choose the app for viewing help? I do not have webkit, so I need an external browser. Even though I set the default app for text/html, text/xml, and application/xml to kfmclient (konqueror), gimp help always open in a TEXT EDITOR, which is the stupidest thing it could do. does indeed open in konqueror, as desired. The only thing that works so far is to uninstall the text editor, which again is the stupidest thing to do. I have used various linux KDE distros since 2004 (Mepis - PClinuxOS - now Kubuntu 16.04) and for most of the time Gimp F1 help, either local or on-line has not worked. Just tried all sorts settings, nothing seems to work for me. Different browser (firefox), changing system settings..etc. Having said that just tried a xubuntu 16.04 VM with firefox as the webbrowser and that works fine. Must be a KDE thing. Searchable and with an index, a good off-line alternative. Out of curiosity. Which KDE linux are you using? I use Kubuntu 16.04 and the help works (remote version in Firefox). I assume Gimp uses whatever is defined to open HTML files in GTK. Looking at my very basic Kubunto 16.04 virtual machine + stock Gimp 2.8.16 + help installed from the repo. "Calling error for procedure plug-in-web-browser No application is registered as handling this file"
"Perhaps you are missing GIO backends and need to install GVFS?" Still prefer the PDF version. Gvfs requires a lot of gnome stuff, including some daemons, so no thanks. I am compiling webkit now, so that gimp can have its own help browser. I was hoping for a simpler solution. THis has been compiling for hours. To answer the question, the DE is Trinity (KDE3). Hoping it's not too late ( weeks ) my 2c worth some Linux distros do not work well with the help docs for gimp and that is why I don't use those distros left behind in the dust , why should I HAVE TO use a pdf , shift f1 or f1 should be it but just as a point of interest Linux > SolydK did not have help docs in gimp work as it should have in past so after leaving and distro hopping and coming back to SolydK ( love-it ) after about 4 months they now had the the help docs in Synaptic so I didn't have to use a clumsy pdf instead shift + F1 in gimp does the job very nicely now , it gets firefox running when offline also that is a win , sometimes you either have to wait for your distro to catch , file a bug report, don't forget mostly all done by volunteers after their day jobs or you go and explore the many distros available ,, The important thing is don't get stressed about that and fixated on that problem , I have been there stressed etc not worth the bottling up but the more distro that you check out the more you know as I mentioned SolydK is good worth checking out as also is GeckoLinux it has a fine set of distros of many flavours also, one man show but very competent . (04-16-2018, 06:53 AM)Redraw Wrote: Hoping it's not too late ( weeks ) my 2c worth some Linux distros do not work well with the help docs for gimp and that is why I don't use those distros left behind in the dust , why should I HAVE TO use a pdf , shift f1 or f1 should be it but just as a point of interest Linux > SolydK did not have help docs in gimp work as it should have in past so after leaving and distro hopping and coming back to SolydK ( love-it ) after about 4 months they now had the the help docs in Synaptic so I didn't have to use a clumsy pdf instead shift + F1 in gimp does the job very nicely now , it gets firefox running when offline also that is a win , sometimes you either have to wait for your distro to catch , file a bug report, don't forget mostly all done by volunteers after their day jobs or you go and explore the many distros available ,, The important thing is don't get stressed about that and fixated on that problem , I have been there stressed etc not worth the bottling up but the more distro that you check out the more you know as I mentioned SolydK is good worth checking out as also is GeckoLinux it has a fine set of distros of many flavours also, one man show but very competent . I don't see anything useful for the topic at hand. I hope my use of punctuation doesn't offend you.